Hop inside the world’s first-ever GPS-guided tour car and hit the town! 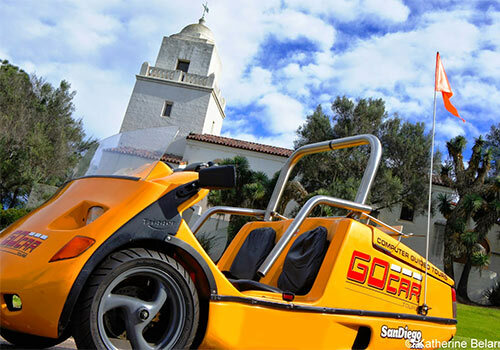 This revolutionary tour experience will allow you to see San Diego’s top landmarks, neighborhoods, and more all from the comfort of your GoCar. Make the tour your own by stopping along the way to try some of San Diego’s renowned restaurants, shopping, and attractions. San Diego is the birth place of California. With its year-round mild and sunny climate, miles of sandy beaches, rich military history, amazing parks and historic old town, San Diego is as full of fun, lore and beauty as any city in America. 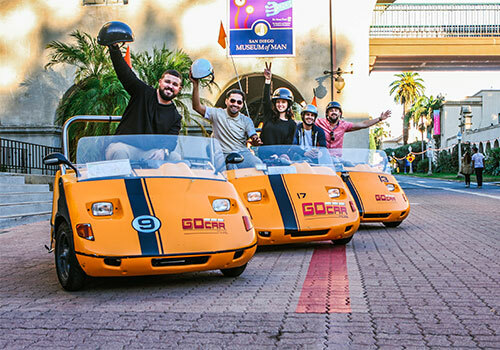 And the GoCar — the first-ever GPS-guided Storytelling car® — is the perfect way to take advantage of that cultural diversity. Especially when it’s time to take a break from the beach! One of the best ways to appreciate San Diego’s wonders is to get out of town. That’s right – tell your car’s tourist-friendly GPS to guide you to the Cabrillo Monument, a shrine erected in honor of the Spanish explorer who landed on local shores in 1542. On a crystal clear day, the panoramic views can’t be beat. Stop along the way to visit the USS Midway aircraft carrier, SeaWorld San Diego or even the world famous San Diego Zoo. And don’t pass up the opportunity to explore all of Balboa Park – with over 25 museums and attractions, it’s the largest cultural park in America. You can make the tour as long or short as you want. Best of all, the adventure happens at your pace. You can stop for photos, take detours, grab a coffee or break for seafood al fresco. You can also blaze your own trail and explore the city streets, neighborhoods and parks on your own. Experience what the press is buzzing about, what visitors rave about, and what Time Magazine called “one of the most amazing inventions of the year. Must be 21 years or older to rent. Must possess a major credit card and valid driver’s license (international license is not necessary). GoCars do not accommodate car seats for children. All riders must sign a standard participant agreement. Renters will have the option to purchase Collision Damage Waiver (CDW) insurance on the day of rental. On the day of rental, a security deposit will be held on the customer’s credit card. The security deposit is released when the GoCar is returned. Renters are free to extend the length of their tour on the day of rental. Additional rental time may be purchased at time of rental and will be charged in 15-minute increments. Tours start at 9:30am and leave every 15 minutes. After purchase, we will contact you directly to confirm your desired date and time based on availability. Cars must be returned to rental location before dusk or scheduled time. 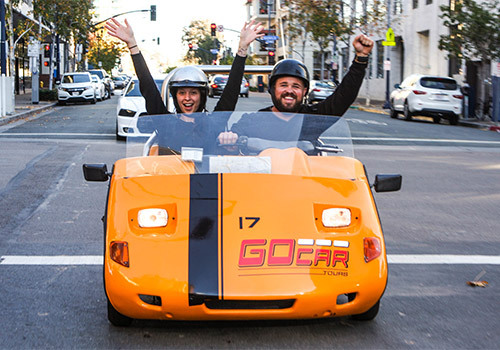 GoCar is the world’s first computer-guided storytelling car. The clever talking car navigates for you, but that’s not all. 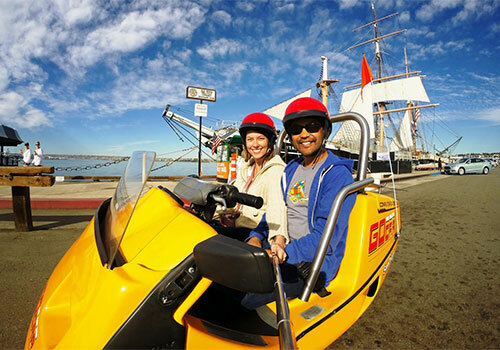 As you drive, it points out the sights and tells you the stories that bring San Diego to life. The tours are as long or as short as you’d like it to be. We offer a variety of tour hours to fit your needs. 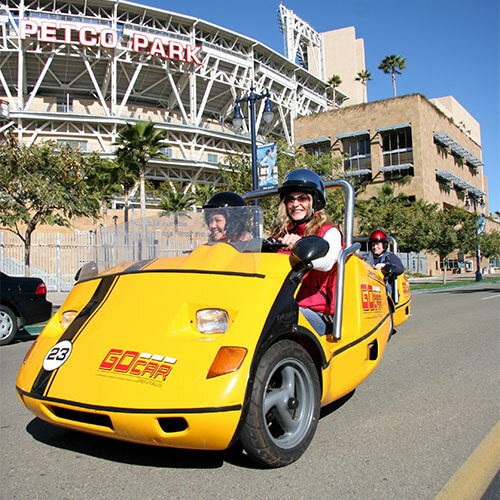 The GoCars allow you to experience San Diego at your own pace. Do I have to stay on the tour navigation? Absolutely not! If there is a sight you wish to see but is not yet included on the tour, just use the map we provide to navigate your own way through the city streets. How many people fit in a GoCar? 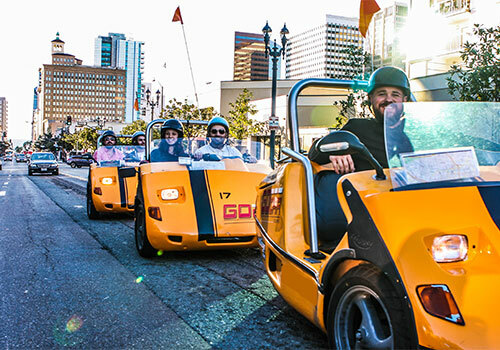 It is possible to go out in a GoCAR in the rain – on the day you can either reschedule your tour with us for a day we expect dry weather or you may cancel with no fee. 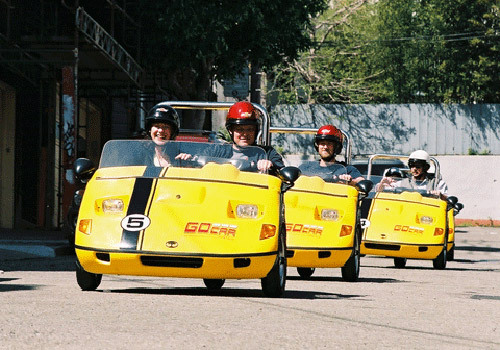 How old do you have to be to rent a GoCar? You must be over 21 years of age to rent and drive a GoCar. What time does my tour start?We will contact you directly after purchase to confirm availability on a tour time and date. Tours depart starting at 9am and leave every 15 minutes. The rental is valid for the number of hours purchased, if you do take additional rental time, you will be billed in 15-minute increments at the retail rates on site. The car must be returned before dusk.